The .45 Colt cartridge has been a staple in the firearms community since its design by the United States Army in 1872 and went into full production in 1873. Later on, the Army decided to discontinue production and went with a different round, the .45 Smith and Wesson Schofield, after some confusion over two similar sounding and similar looking rounds. One of the problems that persisted was that the .45 Smith and Wesson round could fit into the 45 Colt revolver chambers whereas the 45 Colt could not fit into the .45 Smith and Wesson revolver cylinders. Regardless of the discontinuation of military use and production of the .45 Colt, it still holds a special place in the hearts of shooters all over the world and especially in the USA. Even 146+ years later, it is still being used by hunters, by target shooters, in Cowboy Action Shooting competitions, and much more. It is an extremely popular round that should be around for years to come. These Winchester Super-X 45 Colt rounds are designed with the shooter in mind. 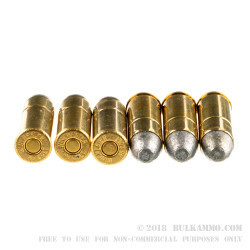 They have large, full lead round nose 255 grain bullets that are loaded tightly into brand new, reloadable, heavy duty, rimmed, straight thick walled, high polished, non-corrosive Boxer primed brass cases. These loads are hard hitting and have a sub-sonic muzzle velocity of 860-feet per second, and a muzzle energy of 420-foot pounds. 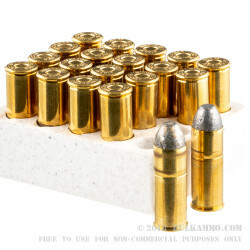 These rounds are suitable for target shooting, competition shooting, and plinking. 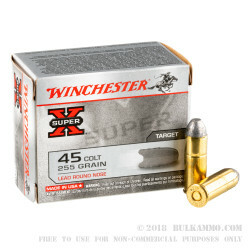 They come with the well-known, recognizable Winchester Super-X logos on each of the 20 rounds boxes. Get yourself a few boxes today so you can get out there and have some action shooting fun.